Get ready to #StopDSEI 2019! Every two years, the global arms trade comes to London. DSEI, one of the world’s largest arms fairs, returns in September 2019. This is where those who profit from war, repression and injustice do business. This is where we can stop them. More than 1,000 arms companies plan to set up shop, marketing their wares to more than 30,000 attendees from around the world. Last time the arms fair came to London, hundreds of people took action to disrupt its set-up. 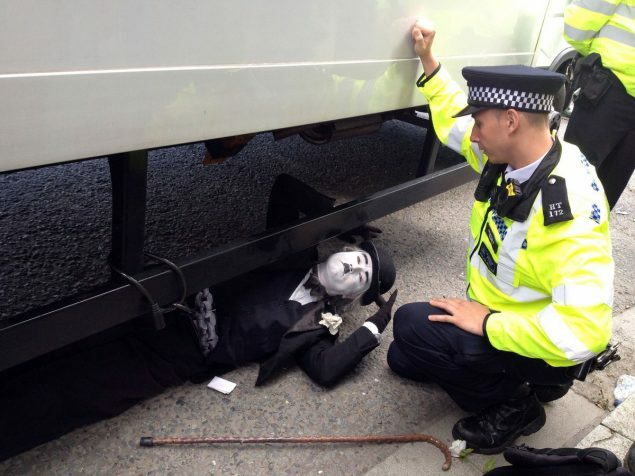 Charlie Chaplin joined the resistance at DSEI 2017. As lorries and trucks transporting armoured vehicles, missiles, sniper rifles, tear gas and bullets attempted to get on site, people from around the world were there to put their bodies in the way. 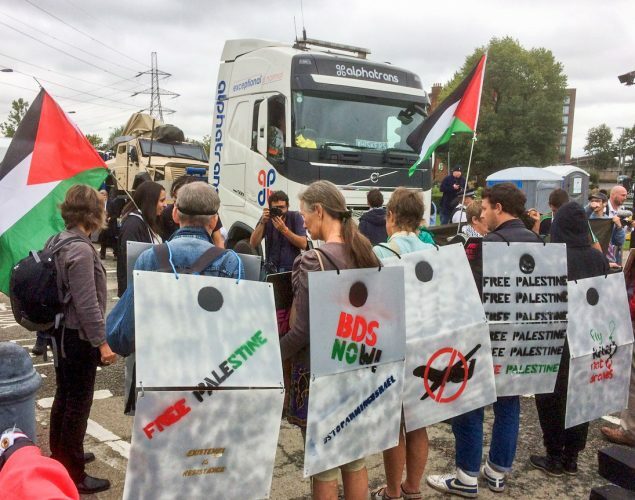 People dressed as the Israeli apartheid wall stand in front of a truck at DSEI 2017. Dabke-dancing, aerobics, an academic conference, a gig on a flatbed truck, abseilers dangling from a bridge, theatre, military veterans undertaking unofficial vehicle checks for banned weapons, Kurdish dancers, rebel clowns, religious gatherings, hip-hop artists, radical picnics, a critical mass of cyclists, Daleks, political choirs, and lots of people in arm-locks all blocked the entrances to the DSEI arms fair repeatedly over the course of a whole week. 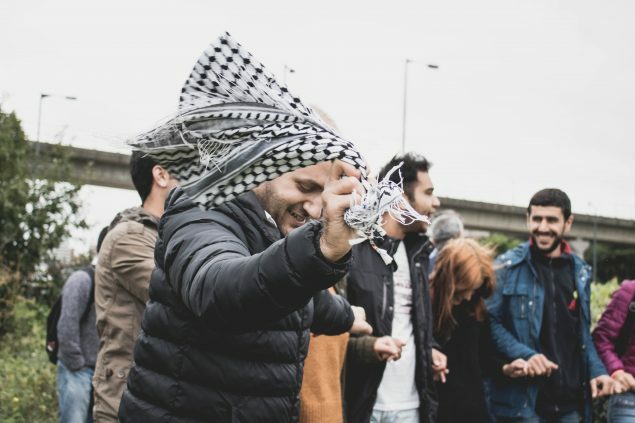 Kurdish activists dance in the road at DSEI 2017. Thousands more amplified the protests by signing petitions, lobbying decision-makers, speaking out online and in their own communities, and helping in diverse ways to make the protests possible. Will you help make 2019 even bigger? Put 2-13 September it in your calendar, and join the Facebook event. Tell us you’re taking action and why. We’ll keep you up-to-date with the latest plans, events and training. It is imperative that the industry for making these weapons is made redundant. Action must be taken before the Arms Fair so that there are no weapons to sell. The British Government increased Defence spending by 83% and last week the Defence Minister Gavin Williamson proudly informed the public that Britain now has strategic military basis all over the world. This is an absolute disgrace when our NHS is being Privatised to make money for the Arms Trade, Homelessness has increased, food banks are being used by many starving families, our Education system is being Privatised because the Government has Cut Funding to these vital systems that improve people’s lives just to fund the 83% increase in Defence Spending. Jeremy Corbyn has let the people down by backing the Renewal of Trident in order to secure his dream of inhabiting 10 Downing Street, Hilary Benn supports armed conflict and the Arms Industry, he does not follow his father’s footsteps. Labour cannot be trusted any more than we can trust the Conservative Government. I support strongly action to be taken to prevent these Weapons being made. There is a Factory in Home Farm Road in Brighton that is making components for weapons. How can we expose this work being carried out funded with our Tax money? 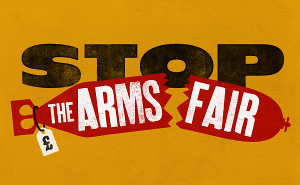 Want to get involved in Stop The Arms Fair? Subscribe to the mailing list by entering your email address here, and we will keep you up to date with upcoming meetings and actions. You can unsubscribe at any time.